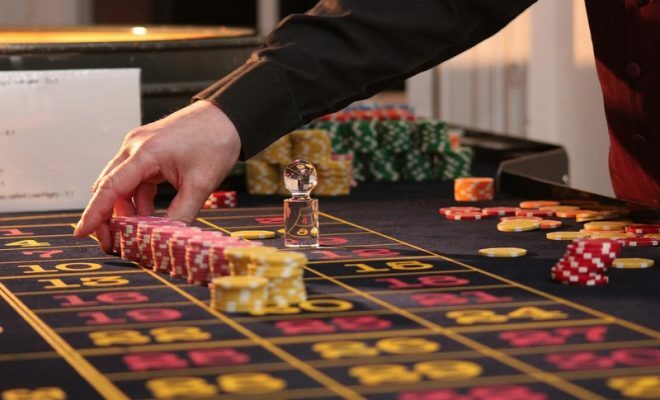 You can go to pretty much any casino in the world and gamble to your hearts content but only in Vegas do you find the entertainment paychecks to rival the jackpots! A recent signing of Lady Gaga for a $75 million 74 date residency crowns Sin City as THE place to see the world’s greatest acts. Not only can you have a glittering holiday at the gambling tables but you can also get the chance to see acts that would normally sell out in your home town. Venues like Caesars Palace attract world class entertainment to keep the hotel guests and visitors feeling special. Stars such as Rod Stewart, Cher and Shania Twain have all performed at the Colosseum, while Mariah Carey is said to have amassed $23,912,616 from just 50 shows there. Celine Dion holds the record for the most shows performed there, dating back to 2003, and has earned more than $229,086,433 through her residency, becoming the most profitable musical casino act since Elvis. There’s more than just Caesars Palace attracting the top international acts – other venues include Planet Hollywood Resort & Casino (featuring Britney Spears, Jennifer Lopez AND Elton John! ), the Westgate (which was the main venue for Elvis), MGM and Mirage Resort and Casino who were great for featuring the top entertainment acts such as magician David Copperfield and legendary magicians Seigfed & Roy. Roy being famously mauled by a tiger live on stage, not before they amassed a staggering 5750 live shows at the venue. David Copperfield has certainly won big in Vegas – his performing career spanning 18 years of residency has brought in a jackpot of $800 MILLION DOLLARS!! 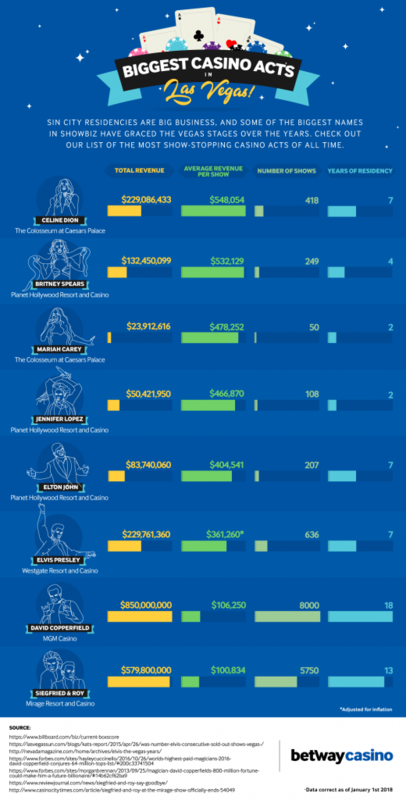 Betway Insider – online games inspired by the buzz of Las Vegas – have created this infographic to encapsulate the stonking earnings of the biggest Casino based acts! Who would you leave the poker table for? Elton John would be a top favourite of ours….